I can't believe I haven't posted all week! Thanks for the nice comments about Dolly. She's a sweetie and although she and Harley haven't exactly bonded, there's been no kitty warfare either. Mostly, they just stare at each other a lot. I'm still amazed at how much Dolly looks like my old cat Charlotte. Like Charlotte, Dolly's a small cat, maybe 8 pounds, and very delicate looking. Here's an old scanned picture of Charlotte, peering down from her perch on top of my monitor. I have been knitting, too. I've finished my hat from David's pattern. Since y'all seem fond of dorky pictures of me in hats, here's another one. Note to self: put on lipstick before taking pictures! Yarn: Pale Pink Elann Peruvian Baby Silk, for the lining; Gray Cascade 220; RPM Pink Brown Sheep Lamb's Pride Worsted (leftover from my Very Cabley Mittens, which i should blog about someday). Needles: size 4 circ for the lining and size 6 circs and dpn's for the body. Mods: I went down a needle size to compensate for my loose knitting and added 10 stitches around (one pattern repeat) to compensate for my big head and the fact that I didn't want a tight hat. 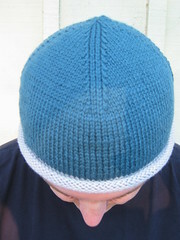 I also added 3 rounds of gray (one just below the colorwork and two just above) to make sure the hat covered my ears. The result is more cloche-y than I think David had in mind, but I'm very happy it! There's also been baking. Many years ago, when I was young and married, I baked most of our bread. More recently, though, baking with yeast has been maybe an annual event. 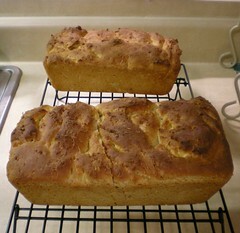 But last Sunday I made cinnamon rolls, and today I made Oatmeal Bread. Let me guess... fresh warm bread?? Look at how cute you are in your hat! Mmmm! You're going to bake bread for me when I come visit, right? And cinnamon rolls? You look totally cute in the hat! Dolly does look like sweet Charlotte. I read "fond of her? in dorky hats?" must be some of her other blog friends- then I saw the picture and was like "OH YEAH! I remember- I AM fond of her in dorky hats." What a great picture and delicious hat. Since Jody bought me the KitchenAid mixer, I bake 99% of our bread because it's just easy now. I love the smell of it baking. Great hat! And man, that bread looks YUMMY! yum! that bread made my mouth water!!! cute hat too! I love tuxedo kitties! My sister has a 20-pound male who is about 18 yrs old. Great looking bread. There is a cat on LOLcats today who reminds me of Simon. Janna, that's some good looking bread! And Dolly is one helluva cute kitty!